Many shortwave radios, such as those manufactured by Grundig/Eton, have been produced with a rubberized coating that makes the radio easier to hold in the hand. I like this coating because it gives me a sure grip on the radio. However, over time (say, two to three years) the coating can break down and begin to produce a sticky residue. All of a sudden your “grippy” coating feels more like tacky paint–even leaving a bit of residue on anything it touches. Many models have this coating: The Grudig G5 and G3, The Eton E1, E1-XM, FR350, FR400, FR500 and FR600, to name a few. After experementing with cotton balls/pads, and using window cleaner and other liquid agents, I managed to decently remove the gummy coating from an Eton FR-400. Best to use 91% Isopropyl Alcohol, and a clean but disposable (dry) wash cloth or something similar. The stronger percentage alcohol makes for easier breaking down of the sticky, and the wash cloth to remove, without damaging the surface or removing lettering. The trick is to always use clean spot on wash cloth, keep from just smearing the stickyness around. The wash cloth will lift and absorb sticky, so keep using a clean spot on cloth. The cloth needs only be damp with alcohol, not dripping wet. Use dry spot on cloth to wipe clean the surface. There may be a hazy white patina, but much of this can be wiped away. It takes a little bit of effort, but the results are worth while. 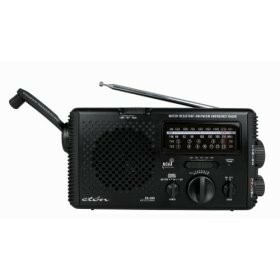 This entry was posted in Radios, Shortwave Radio and tagged Cleaning Radios, How to clean sticky radios, Sticky Radios, Sticky Shortwave Radios on December 14, 2012 by Thomas. Too bad America’s landfills are each day filled with planned obsolescence and a decaying population of fixers. I wanted to salvage the generator, but fingers so sticky even putting in trash. If it’s not built in the 70’s or before, forget it. I used Krud Kutter and a terry cloth towel with lots of rubbing. Works well. No damage to graphics or lettering. This is a CC Crane Observer about 5-6 years old. We’ll see if it returns. I used rubbing alcohol compound (ethanol anhydrous 746.5 mg/ml) and followed your instructions. I saw someone recommend using oven cleaner and a rag. I sprayed no fume oven cleaner on a dry magic eraser and it worked instantly. Used a dry rag to polish it. Just don’t scrub the lettering off. My radio was very sentimental as it belonged to my dad. So glad this worked. I used Elmer’s sticky out adhesive remover on my Eton e-100. Like others have said change your rag often otherwise you’ll just smear the sticky residue all over. Radio turned out great in about 30 minutes. I did not have oven cleaner but I had Simple Green all purpose cleaner in a concentrate. So I tried some in a small area to see and it worked amazingly! I have a Grundig mini 300 that I use at ball games so was happy I was able to remove all the stickiness. Just cleaned my Eton E1 with EZ-Off oven cleaner, dabbed on with a cotton cloth & immediately wiped off, a square inch at a time. Used swabs for tight spots. Looks great! Took about an hour. What about painting over the white sticky surface with clear lacquer or clear epoxy paint, while preserving the black lettering? Any ideas? The quality of the radio tuner is excellent and I would hate to trash it. Have the same issue with “Mini 300” I used medical alcohol prep pads and sticky came off! Not rubber coating but plastic. Anyone think this is from finger prints and acid from those prints? Was ready to discard the radio to the e-heap, but before that final act decided to google the problem, and oh my, so many with the same thing. I could not figure it out, used paint thinner(a respondent just above me had success) well I did not, it spread the gunk all over instead.Also tried nail polish remover to no avail, it became even stickier. Then wanted to buy a new one but I am glad I did not do that, would have been the same problem. I hadn’t used my Eton in several years and just discovered that it had this problem. I used paint thinner (not laquer thinner!) applied sparingly to a paper towel and cleaned half in about 5-10 minutes. The next day I did the other half using a paper towel and q-tips for the recessed areas. That was another 10 minutes or so. The haze mentioned above is not evident. I don’t know why it would take hours to do this. Perhaps the coatings are different or maybe mine was so far gone that it came off easily. I would be leery of using a water based cleaner – if it gets inside the radio it could be the end. Does anyone know if the manufacturer will help out with this stickiness problem. Usually manufacturers stand by their product. If the radio is within its warranty period, I’m sure Eton will help. Typically, though, the sticky residue surfaces after a few years of use. My G3 hasn’t developed it yet, but a 7 year old FR-350 has. Tom I called the company. I spoke to customer support. The guy I spoke to one about the sticky problem and told me to try nail polish remover. He said that may work. Basically he wasn’t much help. But who knows, if you can stand the fumes I guess it could work. I tried the borax idea – 5 dollar box of borax and dollar dobie sponge and it was clean in 10-15 min. I found a real easy fix. Use borax on a moist rag and it wipes off easy. Then use a vacuum cleaner to get the borax off the radio. I had one of these I bought off of ebay a few years back that developed this stickiness. I thought it must be defective so I threw it out eventually. I recently found my original Eaton G10 and it had developed the exact same issue, plus it was completely covered in cat hair! So far I’m resisting the temptation to chuck it. I used olive oil and paper towels to clean this gunk off. It works great and doesn’t leave a white residue. Oil and a cloth would be better than paper towels though. I use the same method on removing glue left over from labels or things like that. I’m not sure if it’s worth keeping this radio if this glue stuff will keep leaching out. Very dumb design for an otherwise great radio. After cleaning good with the 91 rubbing alcohol, give the cabinet a good waxing with a carnauba liquid cleaner /wax. It removes remaining stickiness and the ugly haze left by the alcohol. Sean, the service is worth your asking price but, sadly, a new Eton radio costs the same or less, money-wise. And that problem exists across the world of appliances, electronics and autos. Ownership ought to be obsolete. Leasing serves better, for a better world. Revenue from leasing leads to: Tons of service jobs created everywhere! products designed and manufactured in anticipation of their ongoing fixability! Landfills left hungry! and other subversions of today’s unhappy status quo. After successfully finding a good solution to this issue specifically with the Eton E1 and E1XM, I am now going to put myself on a limb and say that for those not brave enough to tackle the issue on their own E1 radios, I may be able to help them (E1 and E1XM only for now). I have decided to offer this as a service to folks outside my circle of friends now. Because it takes anyplace from 4-5 hours to thoroughly remove the coating from these radios I am looking at charging $100 plus shipping. I know that sounds like a lot for a radio someone already spent a bunch of money on but these are great radios and I have heard from some people that they just find them totally unusable as they continue to get more and more gummy with age. Removing the gummy surface coating is not easy, takes a lot of time and some materials so the cost is actually reasonable for the effort. These radios, when they are not suffering from the dreaded display issues are well worth keeping alive and in play. One issue I wondered about before tackling my first subject radio was, is the lettering on top of or underneath the gummy residue? It’s under and pretty well painted on. Still, with some chemicals there is a chance of them rubbing off so if you do this at home, be cautious of the chemicals you use. My Eton E1 nows looks better than new. About six hours of rubbing, wiping and patience! Was spurred on by seeing the original white printing revealing itself. Final polish achieved by using a soft impregnated shoe mitt that are sometimes provided in hotels. I tried this method with my Eton E1, and it worked great! It is so nice to be rid of that sticky stuff that covered the radio; thank you for the tip! and clean dry rag to remove the residue. It did a reasonable good, but not perfect job. You would think that with all of the complaints over the years that the manufacturer would have substituted more more appropriate material. When the first thing that appears in google search for Eton radios is “eton radio sticky” you know something is wrong.